Wudang Daoyuan internal kung fu academy,a 2-story traditional Chinese rectangular courtyard with green glazed tiles, is situated at the entrance to Xiaoyao Gu(Carefree valley or Monkey Valley）,which is a pure natural picturesque landscape with Sword river flowing through and monkeys everywhere. Daoyuan Academy is close to Prince Temple,Dragon spring Temple,Live avenue of Karate kid 2012 and the deserted temple called Yuxu Crag rebuilt in Qing dynasty. Boasting tranquile environment, fresh air, convenient transportations ,clean rooms with TV, heater, airconditioner and necessities needed ,traditional archetectures ,picturesque sceneray and home-made farmer-style foods ,Wudang Daoyuan Academy is a perfect dwelling for immortality ! Wudang Daoyuan Internal Kung Fu Academy owns a team of masters who have clear linage dating back to 600 years ago and been training for over 20 years with rich teaching experiences . We have cultivated hundreds of people with martial art ability which enjoys a high reputation in the martial art circle both at home and abroad. 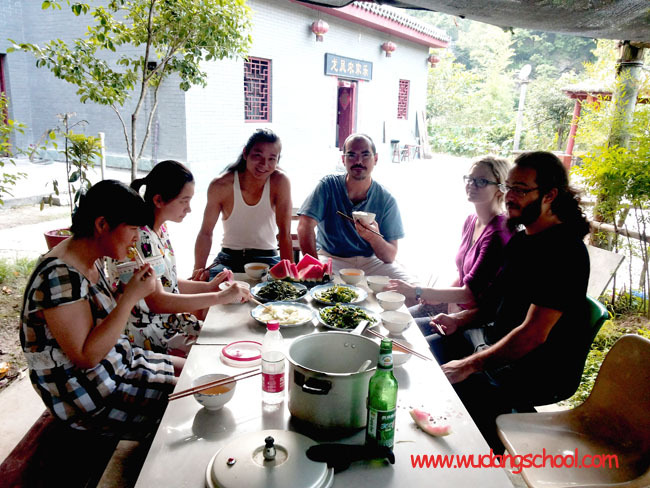 Wudang Daoyuan Internal Kungfu Academy-A Paradise for healthpreserving ! We focus on traditional Wudang Internal Songxi martial arts:Taiji,Bagua,Xingyi,Weapons,Qigong ,Taoist healthpreserving,Taoist medicines and I-ching.Individual demands and personality are always taken into consideration in customizing your training schedule regardless of your age,region and religion.According to different demands,duration we tailor different short and long-term programes.Our teaching mode follows:master’s demonstration,theoretical explanations,hand in hand and one to one teaching.. So it is truly an ideal place for enjoying the splendid scenery of the world cultural heritage as well as learning the Taoist culture and training for the authentic Wudang martial arts. As a Holy Land of Taoism and a cradle of Wudang martial arts, Wudang Mountains have a long history over 2000 years. At the end of Yuan Dynasty(1271-1368) and the beginning of Ming Dynasty(1368-1644), Wudang Taoist Zhang Sanfeng integrated the main achievements of Wudang Boxing and created the Wudang inner Boxing, which made him the respectful founder of Wudang Martial Art. The martial art of Wudang has been once unknown to the outside for fairly a long time due to the tradition of Taoism of instructing privately. In the main trend of globalization, each nation changed itself from autarky to　interdependence. The material products have been circulated worldwide, and the spirit　products will surely be the common possessions of mankind. So the Taoist culture is attracting more and more attention in the whole world. And the Taoist Martial Art, which is the embodiment of Taoist philosophy, is accepted by more and more people. Mr. Lu Xun has said: “ The bedrock of Chinese culture lies all in Taoism.” The exchange of traditional culture between two nations should firstly protect the cultural bedrock of its own nation. The purpose of the establishment of Wudang Daoyuan Internal Kungfu Academy is to spread Taoist culture to the whole world and let more people benefit from wudang taoist martial arts and taoist healthpreserving.